"You each have a personal vendetta against the Justice League. Their deaths would serve my goals. You've all tried and failed to kill members of the League on multiple occasions. Welcome to the Legion of Doom." "My actions don't require any defense. In the same situation, I'd do it again. [...] As individuals, and even more so as a group, the Justice League is far too dangerous to lack a failsafe against any misuse of our power. [...] What if we ever use it for some other purpose? If you people can't see the potential danger of an out-of-control Justice League, I don't need to hear a vote. I don't belong here." The last movie written by Dwayne McDuffie before his death, the film was released in February 2012. 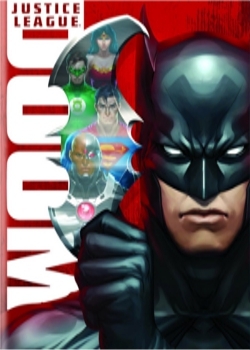 Just like the Superman/Batman movies (and Superman: Brainiac Attacks in regards to Superman and Batman Gotham Knight, the Arkham games and DC Universe Online in regards to Batman), Tim Daly, Kevin Conroy, and Susan Eisenberg reprise their respective roles from the DCAU as Superman, Batman, and Wonder Woman. In the same vein, fellow DCAU voice actors Carl Lumbly, Phil Morris, Olivia d'Abo, Alexis Denisof, and David Kaufman reprise their respective roles as Martian Manhunter, Vandal Savage, Star Sapphire (though d'Abo also voiced a pre-Star Sapphire Carol Ferris in Green Lantern: First Flight), Mirror Master, and Jimmy Olsen, and Nathan Fillion reprises the role of Hal Jordan/Green Lantern from Green Lantern Emerald Knights. Michael Rosenbaum also voices the Flash, but the Flash is Barry Allen and not Wally West like the Flash he voiced in Justice League. Other voice actors include Bumper Robinson (Transformers Animated) as Cyborg, Paul Blackthorne (The Dresden Files) as Metallo, Carlos Alazraqui (Reno 911!) as Bane, Grey DeLisle (The Grim Adventures of Billy and Mandy) as Lois Lane, and Claudia Black (Stargate SG-1) as Cheetah. Affably Evil: Vandal Savage, once more. All There in the Manual: Green Lantern's interactions with Star Sapphire make a lot more sense if you've read the comics. Apocalypse How: Vandal Savage plans to control this by using a device to incinerate the sun facing side of the planet, while ruling over the other. Bane: When we fought before, I broke the Bat. Today, I break the man. Batman Cold Open: Literal version. Beehive Barrier: Hal makes one. Bittersweet Ending: Savage is defeated, the world is saved, all the Leaguers come out alright and Cyborg becomes a member of the league... but the League's faith in Batman is shattered and he himself quits when called out on his actions. That said, it ends a lot better than the comic it's based off of. Here, it's played like a semi-amiable conflict of interest (especially when Superman is involved), in the comic it's a total schism which near shatters the trust of the entire League and has ripple effects to other teams around the DC Universe. Blondes Are Evil: Ma'alefa'ak's disguise as a blonde woman. Bond One-Liner: A villainous example. When Ma'alefa'ak, disguised as a human woman asks John Jones for a light, he replies "I don't smoke." After poisoning J'onn to make his skin secrete magnesium and setting him on fire to burn to death, he casually walks out of the diner, scoffing "He 'doesn't smoke...'"
Bond Villain Stupidity: Bane's first fight against Batman is a Curb Stomp Battle that ends with him dumping the still-living but quite unconscious Bruce Wayne into the grave of one of his parents and burying him alive. If he had simply killed him then and there rather than deciding to humiliate them, the Legion of Doom would probably have won. For that matter, if Star Sapphire had killed Green Lantern while he was vulnerable during his Heroic BSOD, the bad guys would likely have succeeded. Buried Alive: Happens to Batman. Combat Tentacles: Star Sapphire seems fond of these. Composite Character: In design rather than characterization. Cyborg's personailty is closer to his comics counterpart, but his design melds elements from his look from the Teen Titans animated series. The Flash is Barry Allen, but acts (and sounds) like Wally West. Crazy Prepared: Batman. This proves to be the impetus for the plot, as Batman had made plans to take down the League just in case. The others see it as paranoia, but he sincerely believes that all of them need to have something that can take them down just in case the worst happens - even himself. Considering the readiness with which he countered the plans, it's likely that Batman also had contingency plans for the contingency plans. Curb Stomp Battle: Superman gets two. In the first, when fighting the Royal Flush Gang, the super-strong Ace slams the Man of Steel with a huge vault door. For a moment it seems Supes has taken some serious damage, but that's only because the focus switches to the other Leagers' battle. When the attention returns to Superman and Ace, the former blasts through the vault with his heat vision, then simply stands there while Ace ineffectually pounds at him until Ace literally breaks his own arm off. Then Superman catches the other fist, crushes it, and finally tears Ace in two with one punch (but only after saying "Goodbye, Ace.") In the second, it's Superman versus Metallo. At first this one looks like it might be an actual fight, as Metallo has Kryptonite and briefly has the upper hand -- until Superman decides he has more pressing matters to attend to, and simply decapitates Metallo with his heat vision. Bane's first fight against Batman also counts. Bats only survives because of Bane's Bond Villain Stupidity, as explained above. Darkest Hour: When Superman is shot with a kryptonite bullet and falls from the top of the Daily Planet tower, shots of him falling are interspersed with shots of the rest of the Justice League facing their own demises. Death Dealer: Queen of the Royal Flush Gang. Decapitation Presentation: Batman holds up the head of the robotic Carol. Determinator: Batman. This is a man who punches his way out of a grave through six feet of Earth and returns to action without resting or waiting to recover. Doppelganger Attack: Mirror Master favors this form of combat. Even the Girls Want Her: Thanks to Wonder Woman's hallucinations, one of the many Cheetah copies remarks on how attractive she is. Evil Twin: Well, Ma'alefa'ak is the Martian Manhunter's brother. Eye Beam: Jack of the Royal Flush Gang. And of course there's Superman's heat-vision, which is the deciding factor in his second fight with Metallo. Gender Bender: Ma'alefa'ak transforms into a hot blonde woman to tempt the Martian Manhunter into lowering his guard. Heroic BSOD: The plan to take down Green Lantern involves putting him in one of these with lots of trickery and a healthy dose of fear gas. Hero Insurance: Wonder Woman clearly has her premiums paid up. Cheetah uses some Applied Phlebotinum to force Diana to see everyone around her as Cheetah, causing the Amazon to assault what may be dozens of civilians and cops, not to mention ripping off Cyborg's arm. Cyborg snaps her out of it, but still, she's committed a good number of assaults of Muggles and never gets called on it. Well, not to her face. I Did What I Had to Do: Batman's reason for the contingency plans. Idiot Ball: In-story, Green Lantern pretty much accuses Batman of carrying the ball. GL's actually okay with the idea of Batman having contingency plans to take down the League; what he objects to is Batman letting those items be stolen. Lady in Red: A blonde woman in a red dress J'onn meets in the bar. It was Ma'alefa'ak in disguise. Legion of Doom: That goes without saying, although it's not the usual group (other than Cheetah). Leeroy Jenkins: In the beginning, Superman asks Batman to wait for backup, but Batman shuts off his communicator and charges in. The Royal Flush Gang kicks the crap out of him before the Justice League shows up. Mars Needs Women: A literal example as J'onn really seemed attracted to that hot blonde who was hitting on him, until he realized she was Ma'alefa'ak in disguise. Mythology Gag: Jack sarcastically mentions Robin when King warns him that Batman wouldn't have attacked the Gang's heist alone. Savage mentions that he payed LexCorp for the device Mirror Master uses to steal Batman's files. Green Lantern was attacked with a version of Scarecrow's fear gas. Vandal Savage's plan involving solar flares is similar to the Legion of Doom's plan Gone Horribly Wrong in an episode of Superfriends. Neck Snap: Bane does this to an alligator that attacks him. Nice Job Breaking It, Hero: Arguably, everything the League goes through is Batman's fault. Nice Job Fixing It, Villain: Bane's arrogance essentially leads to the downfall of the Legion. Burying Batman alive with his parents is really only going to serve to remind him why he's Batman, and piss him off. Batman himself lampshades this. No Badass to His Valet: In the opening battle sequence, Batman gets pretty badly hurt, but being Batman wants to shrug it off and keeps working. Wonder Woman offers to let him use her Purple Healing Ray to cut down his recuperation time; he ignores her. But when he's back at the Batcave, Alfred insists that he rest and get medical care, and stares him down. Noodle Incident: Hal Jordan's long and sordid past with Star Sapphire. It's brought up several times in an important context but not actually explained. Also, Martian Manhunter mentions a previous fight between the League and the Royal Flush Gang which left Superman embarrassed by Ace. No details are given. Leads directly to a Curb Stomp Battle. No-Holds-Barred Beatdown: Bane delivers one to Bruce Wayne, beating him unconscious, then burying him alive. Won't Work On Me: Ace really isn't a match for the man of Steel. Off with His Head: Superman decapitates Metallo with his heat vision. Oh Crap: The entire Legion when Savage gets up after Cheetah slashes his throat. Batman, when he realizes that his contingency plans are being used against the League. Ma'alefa'ak when Savage's missile ignites in his face. 10 in the first battle, literally: "Crap! It's the Justice League." Opponent Switch: Sadly averted: In the climactic battle, the Leaguers begin the attack, and all of them attack their designated arch-enemies. But since their purpose was less to capture the villains than to stop their missile from launching, and time was clearly a factor. You'd think brilliant combat tactician Batman would have suggested that Superman trade opponents with either Green Lantern or Martian Manhunter, as Metallo's kryptonite weaponry makes him pretty much a one-trick pony. Outrun the Fireball: Flash, after vibrating the bomb off his wrist. Being the Fastest Man Alive, of course, means he literally can outrun the fireball (though the shrapnel wings him). The Power of Trust: A major theme. Though it's not quite as shattered as in "Tower Of Babel," mostly as it isn't revealed until well after he's gone out of his way to save them all, the team's trust in Batman is wavered by the fact that he made the plans against them in the first place. In the end, however, it leads to a heartwarming moment of sorts where it's shown that even though they don't like his methods they, particularly Superman, still trust him to do what's right even if it's against them, and likewise Batman trusts the League to counter him should he go too far. Provoke Me Taunt: Green Lantern delivers one to Ten after the first warning shot. "Give up? Please say 'no.'" Punch-Punch-Punch Uh-Oh: Ace repeatedly punches Superman without so much as making him blink. The last time, Ace's arm explodes. Recursive Ammo: Vandal Savage's missile works this way. In multiple layers, no less. Servile Snarker: Alfred, who is in top form. Shapeshifter Showdown: J'onn vs. Ma'alefa'ak. Shock and Awe: Ten of the Royal Flush Gang. Spanner in the Works: Cyborg. The Stoic: Ma'alefa'ak. While the rest of the Legion celebrates the apparent destruction of the Justice League, he simply leans back without a word. He only loses his cool when Martian Manhunter is revealed to be alive, and when the missile ignites in his face. Martian Manhunter as well. When King knocks him out, he just looks up and says, completely deadpan, "I am unharmed". He loses his cool when Ma'alefa'ak attacks him, but in his defense it's hard to remain calm when you're on fire. Stripperiffic: Star Sapphire in her current costume. Bane's also shows off more skin than needed. Superman Can Breathe In Space: And he also talks too. Talking to Himself: Carl Lumbly voices both Martian Manhunter and Ma'alefa'ak. Batman: The Justice League is under attack! The Legion of Doom, to an extent. Savage is the only one explicitly said to be in prison. Ma'alefa'ak is likely dead, given his proximity to the missile when it launched, and one could assume the other five were arrested, but it's never brought up. Also, the old lady in the "hostage box." Since she vanishes immediately after Flash is tagged with the bomb, it's most likely she was just a hologram of Mirror Master's. But, again, they don't actually address it. What the Hell, Hero? : Wonder Woman begins to give Batman one of these speeches, but is cut off. Superman finishes it (rather nicely), calling the Dark Knight "arrogant" to his face. Whip It Good: How Wonder Woman uses her Golden Lasso. Whole-Plot Reference: The plot is loosely adapted from the "Tower of Babel" story from the comics. Woman Scorned: Pretty clearly this is Star Sapphire's problem with Green Lantern. The Worf Effect: Happily averted. When he's in an ensemble, Superman often goes down very easily to emphasize how dangerous an opponent is; early seasons of Justice League were especially bad about this. But in Doom he is clearly the team's mightiest member. This page was last edited on 5 September 2018, at 18:59.